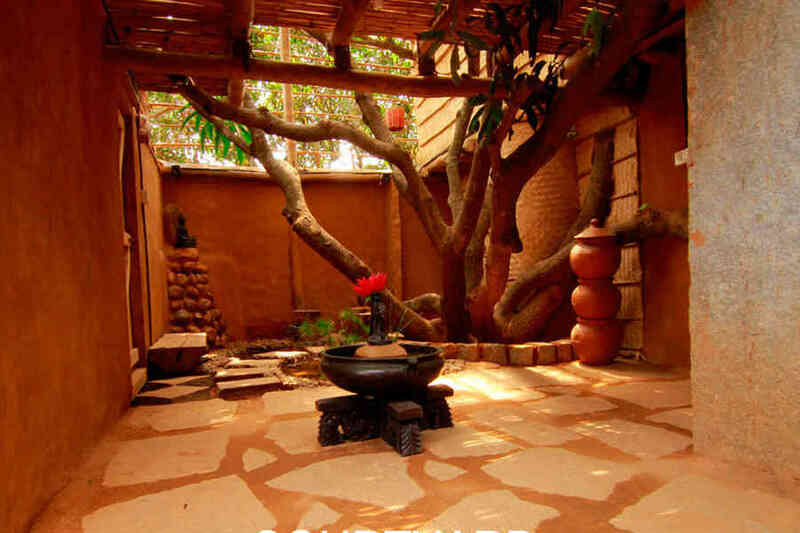 Use the form below to inquire about Rustic Treehouse Off Hennur Road Bangalore . Use the form below to reserve for Rustic Treehouse Off Hennur Road Bangalore . It has two bedrooms with en-suite bathrooms. 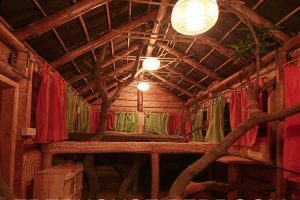 Spend a spartan yet relaxing weekend without traveling too far from the city at this stunningly quaint and Rustic Treehouse Off Hennur Road. 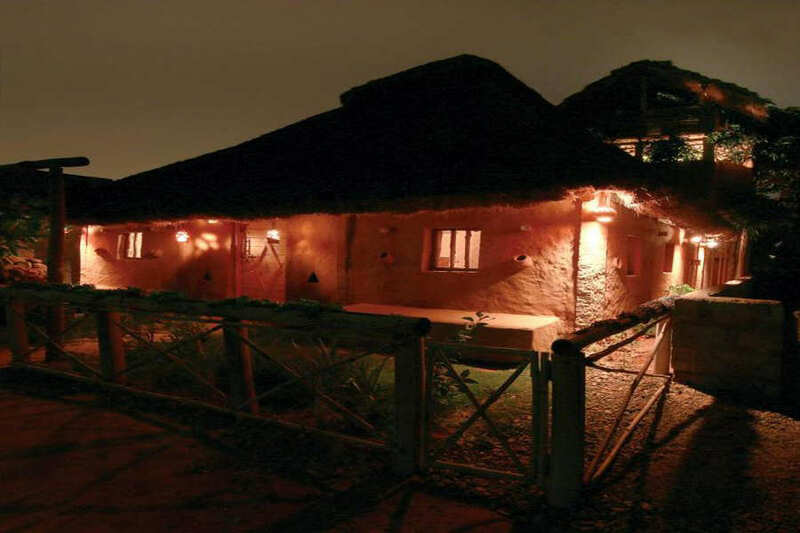 Located on the outskirts of Bangalore, this Rustic Treehouse Off Hennur Road sits on a quiet slice of land surrounded by lush foliage. An easy drive from the heart of the city, this homestay spread over 2,000 sq ft is perfect for distancing yourself from the digital world. The silence at this property in the suburbs is perfect for discovering yourself and for forging new relationships. 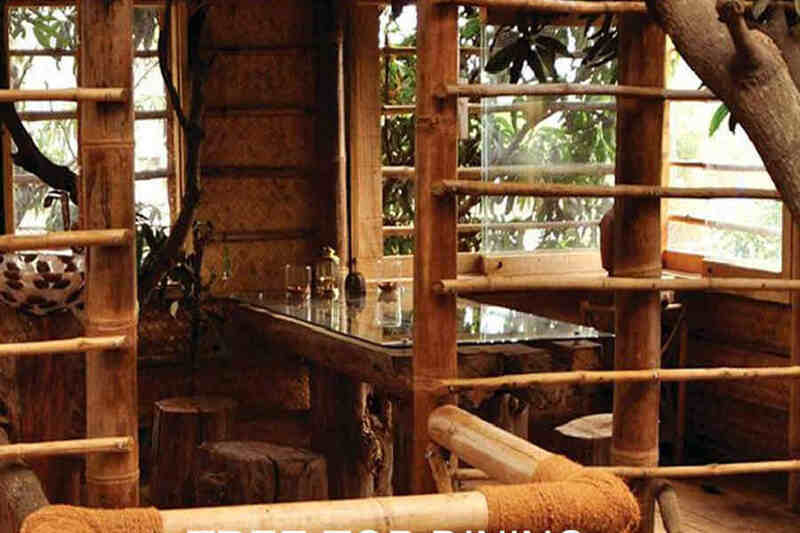 Built from natural materials such as wood, bamboo, and mud, this Rustic Treehouse Off Hennur Road incorporates the surrounding nature into its design. You can find tree trunks acting as supporting beams for the roof and prop up the walls here. It does not have the comforts or luxuries that feature at most resorts and the focus is on unwinding in solitude and leaving rejuvenated. You are free to organize events of your choice such as seminars, get-togethers, team building activities, workshops in photography, music and art sessions, Kalari or Yoga sessions, or camping in consultation with the management. 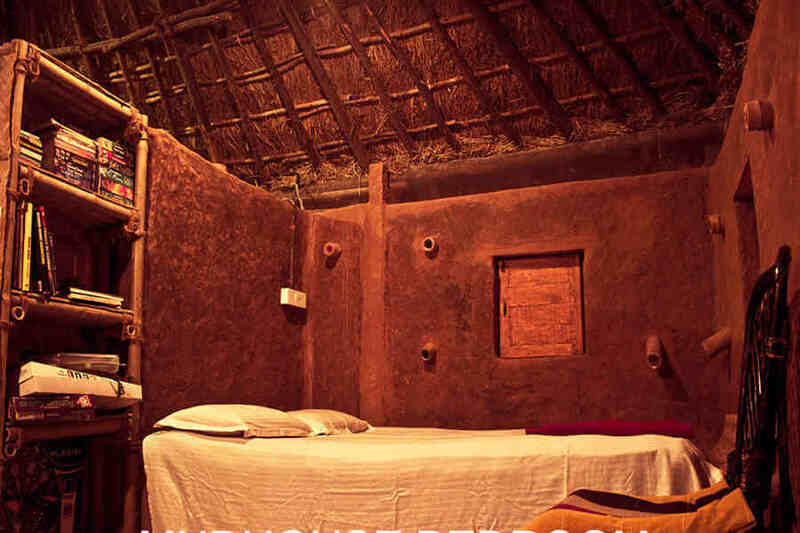 The meals here are fresh, home-cooked food rustled up by the chef with vegetarian and non-vegetarian options available. Some board games and books are available as also a puddle pool to wet your toes. 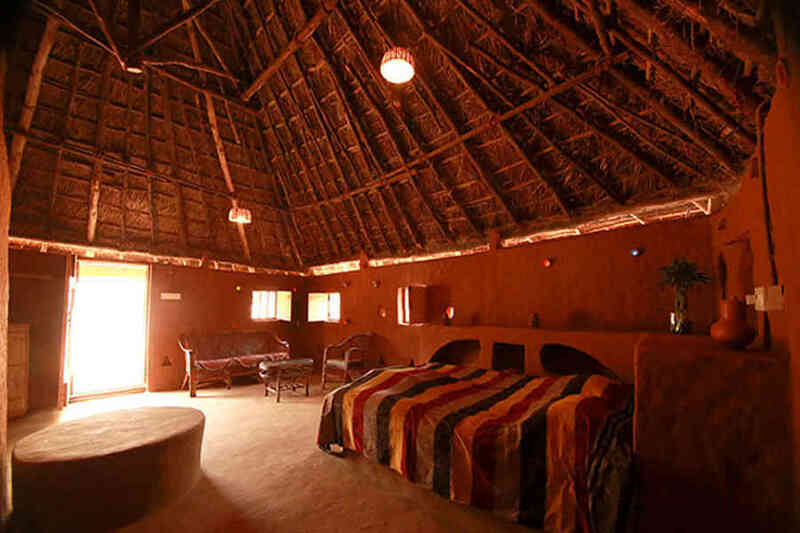 Accommodation is available in the treehouse, a mud house, and a smaller room. All come with attached bathrooms. The mud house has two bedrooms and can accommodate up to five people at a time while the treehouse features a dining and living area beside the bed and bath. 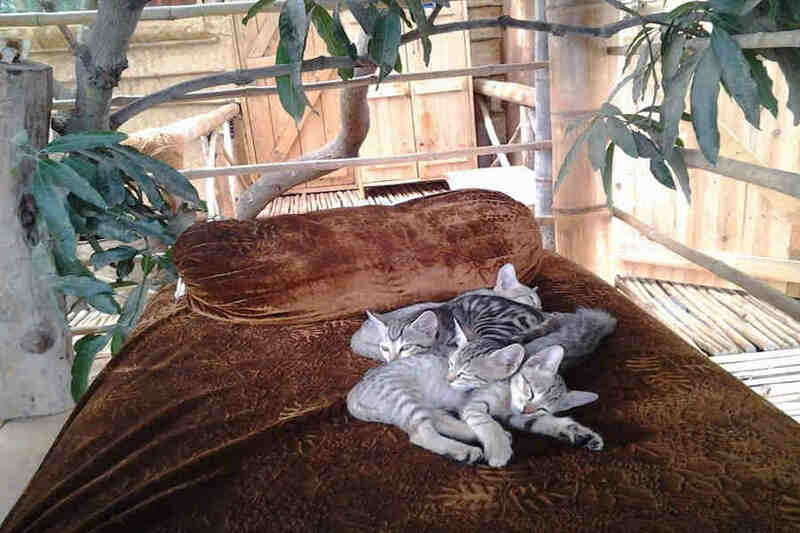 There is no television or air conditioning in any of the rooms. Perfect for a weekend that takes you back to a time when life was earthy! Children up to 5 years of age will be complimentary. Children between 5 to 12 years will be charged 50% of the adult rate. Above 12 years will be considered as an extra adult. This rustic getaway is more of a place to contemplate in solitude or indulge in some quality bonding with friends and family. There are some books to keep you company and board games for some fun. Besides this, various events and activities can be organized and customized as per your requirements. From workshops to book readings to barbecue evenings and seminars, this is a great venue. 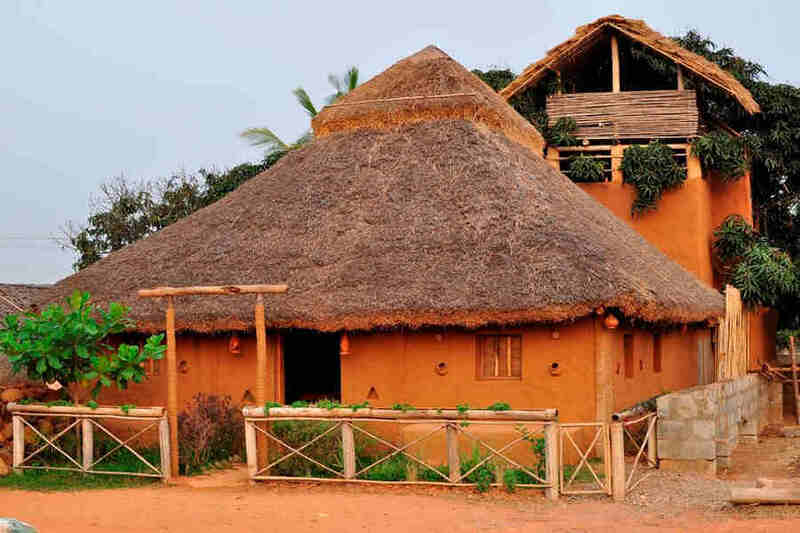 Sessions on music, art, literature, yoga, and Kalari, as well as camping and photo shoots, can be held here for individuals as well as groups comprising anywhere between eight to fifteen people. 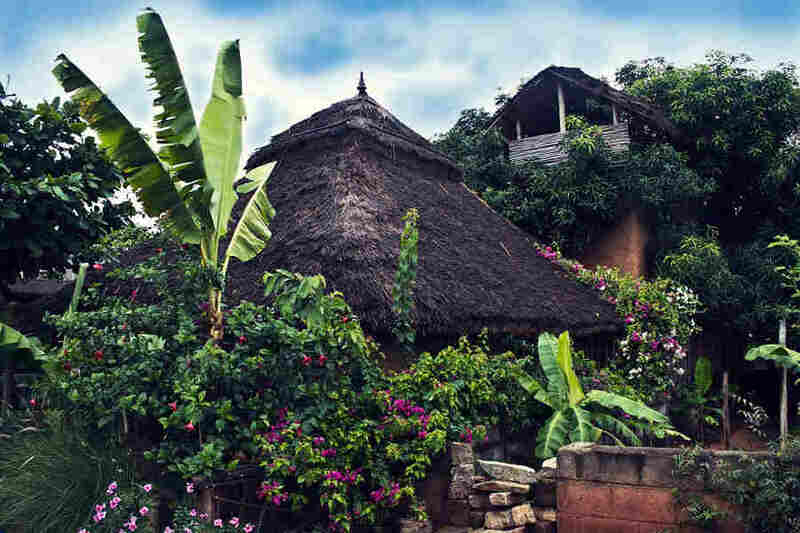 Bachelorette parties, archery sessions, storytelling for kids, and friendship meets are some of the events this homestay has hosted. The city of Bangalore is within easy reach and so are the many attractions found in the sprawling metropolis. Phoenix Market City Mall, the spectacular Bangalore Palace with its Tudor style architecture, the interactive Visvesaraya Industrial and Technological Museum, the aesthetically laid out Lalbagh Botanical Garden, the famous Cubbon Park, shopping areas of Brigade Road and Indiranagar which are also hubs of nightlife, are all within easy reach from this property. Kempegowda International Airport, Bangalore, is the closest to the property at 44 km. Chennai airport is 315 km away. Bangalore railway station is at a distance of 25 km while Hosur railway station is 57 km away. Tumkur railway station is 81 km away and Hassan railway station is at a distance of 189 km. Bangalore city is around 22 km from the property via Bellary Road while Mysore is at a distance of 172 km via NH275. Shravanabelagola is 151 km via NH75.